We love baking easy cookie recipes especially on a rainy day. You may like to make this into an interesting learning experience. You can start with asking the children to choose a cookie recipe. The kids can help to read the ingredients. Show the kids how to check whether the necessary ingredients for the cookies are in your kitchen. Then check whats needed from the recipes for a shopping list If the kids are able to,they can write a shopping list for cookie making. If your child cannot write yet, get them to draw the items you need. Go with your children with their cookie shopping list to the grocery store. Encourage kids to find the ingredients needed and add them to a shopping basket.. This helps kids to learn independence. 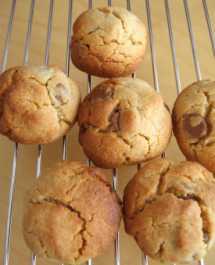 We hope you enjoy the free cookie recipes on this page. 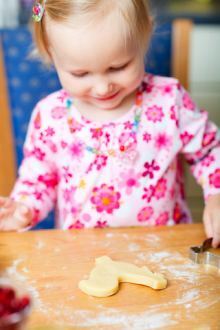 When you are ready to make a cookie, help kids to don aprons and thoroughly wash their hands. The children can then collect ingredients ready to weigh them out. We find it easier to work at the dining room table as this gives us more space to work, and it is a better height for children to work at. You will need to start: A mixing bowl, a small bowl, a whisk. a sieve, a wooden spoon or two, a measuring jug, 2 baking trays, 2 desert spoons, aprons. Ask kids to grease the 2 baking trays. They can put the butter or margerine and the sugar into the mixing bowl. Beat them together with wooden spoon until it is light in color and creamy. Get kids to break eggs into the small bowl. Get them to use a whisk or fork to beat eggs. They can then add vanilla essence. Then pour this mixture into the mixing bowl, mix together. Ask kids to hold sieve over large bowl and sieve in flour. Mix this together until smooth. The kids can add 8oz chocolate chips and stir. Take desert spoons and put heaped spoonfuls of the mixture onto trays. Place in middle of the oven for about 15 minutes. They should still feel slightly soft when cooked. You will need: A mixing bowl, small bowl, a whisk. a sieve, a wooden spoon or two, a measuring jug, 2 baking trays, 2 desert spoons, clingfilm, aprons. Ask children to grease the 2 baking trays for the cookies. They can put the peanut butter into the mixing bowl. Beat them together with wooden spoon. Get children to break egg into the small bowl. Ask them to use a whisk or fork to beat egg. Then pour this into the mixing bowl, mix together. Hold sieve over large bowl and sieve in flourbaking powder and salt. With their hands the kids can bring mixture together into a soft dough. Ask them to wrap dough in clingfilm then put into fridge. After 1/2 an hour break dough into 20 pieces. place these on baking sheets and flatten slightly. Put in ove for around 15 minutes. What you will need: A mixing bowl, small bowl, fork, a wooden spoon or two, a cup, 2 baking trays, 2 desert spoons, aprons. 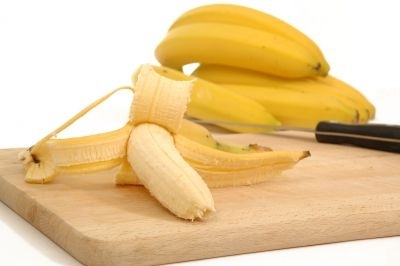 Mash banana in small bowl with fork. Add butter and brown sugar and mix together. In mixing bowl bowl put dry ingredients and mix them together. Add the butter and sugar mixture to dry ingredients, mix together well. Add the nuts and apples to the bowl and mix. Spoon onto greased cookie sheet and bake in oven at 325 degrees for 20 minutes or until golden brown. You will need: A mixing bowl, a wooden spoon or two, a cup, 1 baking tray, aprons. They can then take small amounts and roll into small balls. You will need: A mixing bowl, small pan, a sieve, a wooden spoon or two, a cup, 1 baking trays, 2 desert spoons, aprons. 1 Tablespoon boiling water Pre heat oven to180c. Ask children to hold a sieve over mixing bowl and sieve flour and sugar into it. Get kids to add the oats and coconut. Show kids how to make a well in the centre of these ingredients. Next get kids to watch while you combine the butter and golden syrup in small pan. Stir this over a low heat until butter is melted and it is smooth. Put this immediatly into butter mixture. It will foam up. Ask kids to add butter mixture well in dry ingredients. Stir in dry ingredients from edge of well gradually drawing in all dry ingredients. Place balls on baking trays and flatten slightly on tray. Allow room for spreading. Bake for 20 minutes or until just browned. In these pages you will find cooking activities. From cookie recipes for kids to snacks to main meals there is something for all abilities. 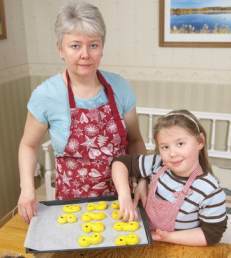 Enjoy the time you spend doing cookie recipes for kids ccoking. As well as valuable family time kids learn many skills while cooking. And kids even enjoy the cleaning up and washing up. Encourage them while they are willing helpers. Take photographs as records of stuff you have done. Our kids love looking back over photos or videos of themselves. Ensure the kids have safety knowledge in the kichen. Most of the items you need for these cookie recipes for kids you will have already in your kitchen. For food ingredients try making lists in advance and buying with your weekly shop. Alternatively use this time to buy ingredients as part of the activity. It is a good part of learning about planning.